Dr. Sharma is an associate professor in the Department of Civil, Construction, and Environmental Engineering at Iowa State University. 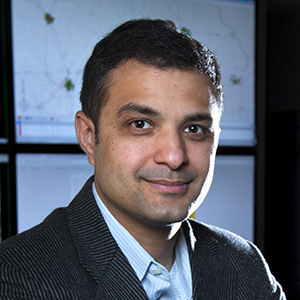 Dr. Sharma’s research has been recognized by numerous funding agencies, including the National Science Foundation, Federal Highway Administration, National Institute of Health, several state departments of transportation, and multiple city public works departments. Dr. Sharma has been granted awards of more than $10 million, which contribute to fund his research. He has served as principal investigator/co-principal investigator for over 32 research projects over 9 years. Performance Based Operations Assessment of Adaptive Traffic Signal Control, October 1, 2016- December 31, 2017, Principal Investigator. Sharma, A., E. Smaglik, S. Kothuri, O. Smith, P. Koonce, and T. Huang. In Press. Leading Pedestrian Interval Implementation as a Marginal Costs and Benefits Problem. recommended for publication in Transportation Research Record: Journal of the Transportation Research Board. Adu-Gyamfi, Y., A. Sharma, S. Knickerbocker, N. Hawkins. In Press. Framework for Evaluating Reliability of Wide-Area Probe Data. Recommended for publication in Transportation Research Record: Journal of the Transportation Research Board. Adu-Gyamfi, Y., S. Asare, and A. Sharma. In Press. Automated Vehicle Recognition with Deep Convolutional Neural Networks. Recommended for publication in Transportation Research Record: Journal of the Transportation Research Board. Zhao, M., C. Liu, A. Sharma. 2017. Multivariate Poisson-Lognormal Model for Analysis of Crashes on Urban Signalized Intersections Approach. Journal of Transportation Safety & Security. Wang, S., A. Sharma, S. Knickerbocker. 2017. Analyzing and Improving the Performance of Dynamic Message Sign Reporting Work Zone Related Congestion. Transportation Research Record: Journal of the Transportation Research Board. Vol. 2617, pp. 71–77. Shefang, W., and A. Sharma. 2017. Assessing the Impact of Speed Limit Reduction near Signalized High-Speed Intersections Equipped with Advance Warning Flashers: A Case Study in Nebraska. Journal of Transportation Engineering. Vol. 143, No. 6. Verghese, V., L. Chenhui, S. Subramanian, L. Vanajakshi, A. Sharma. 2017. Development and Implementation of a Model Based Road Traffic Control Scheme. Journal of Computing in Civil Engineering. Vol. 31, No. 3. Liu, C., A. Sharma, E. Smaglik, and S. Kothuri. 2016. TraSER: A Traffic Signal Event-Based Recorder SoftwareX. Vol. 5, pp. 156–162. Sobie, C., E. Smaglik, A. Sharma, A. Kading, S. Kothuri, and P. Koonce. 2016. Managing User Delay with a Focus on Pedestrian Operations. Transportation Research Record: Journal of the Transportation Research Board. Volume 2558, pp. 20–29. Savolainen, P., A. Sharma, and T. J. Gates. 2016. Driver Decision-Making in the Dilemma Zone – Examining the Influences of Clearance Intervals, Enforcement Cameras and the Provision of Advance Warning through a Random Effects Probit Model. Accident Analysis and Prevention. Volume 96, pp. 351–360. Anusha, S. P, A. Sharma, L. Vanajakshi, S. Subramanian, and L. Rilett. 2016. A Model Based Approach for Queue and Delay Estimation at Signalized Intersections with Erroneous Automated Data. Journal of Transportation Engineering. Vol. 142, No. 5. Zhao, M., A. Sharma, E. J. Smaglik, and T. Overman. 2015. Traffic Signal Battery Backup Systems: Use of Event-Based Traffic Controller Logs in Performance-Based Investment Programming. Transportation Research Record: Journal of the Transportation Research Board. Vol. 2488, pp. 53–61. Gyawali, S., A. Sharma, A. Khattak, and E. J. Smaglik. 2015. Use of Decision Assistance Curves in Advanced Warrant Analysis for Indirect Left-Turn Intersections. Transportation Research Record: Journal of the Transportation Research Board. Vol. 2466, pp. 54–63. Zhao M. and A. Sharma. 2014. Optimal Deployment of Hybrid Alternative Power System at Signalized Intersections. Transportation Research Record: Journal of the Transportation Research Board. Vol. 2438, pp. 72–80.